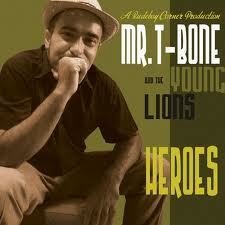 Great 2010 album from ITALY’s top traditional ska / reggae artist MR T BONE & THE YOUNG LIONS! Just finished a tour of California with THE SLACKERS’ DAVE HILYARD and THE ROCKSTEADY SEVEN. MR T BONE’s soulful lyrics and great trombone playing brings comparisons to Germany’s DR RING DING, but plain and simple: if you like roots ska and early reggae sounds, this is your new favorite band! 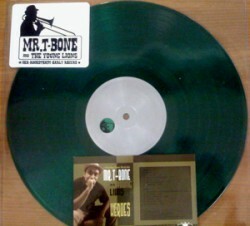 Since 1999, Mr. T-bone has been a member of the BlueBeaters and Africa Unite, which are two of the most influential ska and reggae bands in Italy. During that same year he founded the Jamaican Liberation Orchestra, the first Italian ska-jazz band and recorded the album “THAT’S IT!” (2002). He then composed and interpreted the soundtrack for the movie “Ravanello Pallido” which was a great success in Italy. In 2002 he joined the “New York Ska Jazz Ensemble” and with them he played two European tours and recorded the album “MINOR MOODS”. In 2004 came “MR.T-BONE SEES AMERICA”. He recorded this album in NYC with an all-star line-up including Italian and New York musicians. After the great success of that record, he embarked on a long tour of clubs and festivals that touched 13 European countries in (Italy, Spain, France, Germany, Holland, Belgium, Switzerland, Czech Republic, Hungary, Slovenia, Austria, Serbia and Macedonia). He also appeared at the fallowing international festivals: “Dance ska-La Festival” (France, Rennes 2003) “Astor Piazzolla Music Award” (Italy, Milano 2004) “Bilbao music festival” (Pais Vasco, Bilbao 2005) “Lowlands Paradise Festival” (Holland, Amsterdam 2005) “Three Floors of ska” (USA, New York City 2006) “Eurosonic” (Holland, Groningen 2007) “Fiesta de Irala” (Pais vasco, Bilbao 2008) “Njoki Festival” (Slovenja, Ajdovscina 2008) “Rototom Sunsplash” (Italy, Osoppo 2008) “Mighty Sound Festival” (Czeck Republic, Praha 2008) From this long tour emerged a live recording called “STRICTLY LIVE”, distributed world wide by the spanish Brixton Records. In 2009 MR T BONE launched his own label RUDEBOY CORDER and released this new studio album “HEROES”, with his new band who he is playing with since one year called the Young Lions! Limited edition green VINYL release on JUMP UP Records USA!